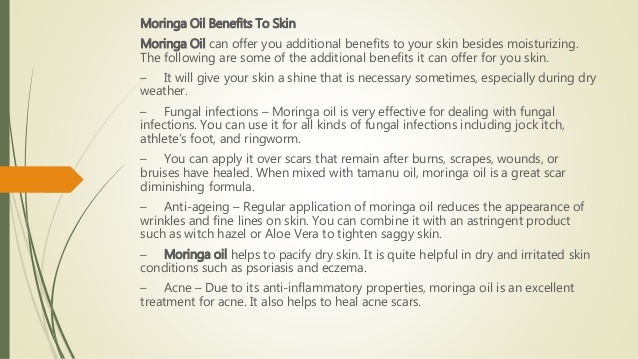 In our opinion Moringa oil is the finest oil in the world. It has an high oleic content and its non drying. An excellent moisturizer, massage oil, antibiotic, anti itch, mosquito repellent and so much more as we spell out below. Use for body and bath. A little goes a long way. Our moringa oil is first cold pressed with a rich sun flower yellow color. It is run through the press just once thus avoiding excessive heat. 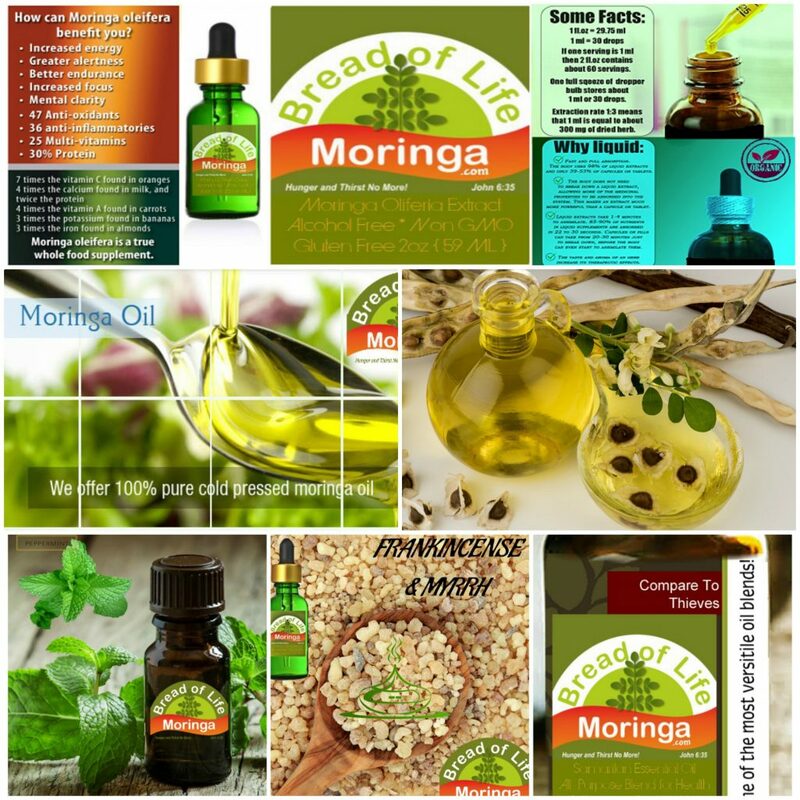 Most all “moringa oil” sold on the market today are not pure, not even close. Moringa oil is incredibly light, spreads easily on the skin and is readily absorbed. It’s high in antioxidants that make the oil useful for preventing and reversing skin damage, and its fatty acid profile is similar to that of olive oil. It takes approximately 500 Moringa seeds to produce 1 oz (29.6 mL) of cold pressed oil. This means it takes approximately 35 mature seed pods to produce 1 oz of oil! Just like Moringa leaves, organic Moringa oil benefits are abundant! The oil has many incredible properties not typically found in a single source. In addition to the oil’s high levels of oleic and behenic fatty acids, the oil has antioxidant and anti-hepatotoxicity properties. This makes the oil a powerful and natural tool for a wide range of applications. The oil is actually known commercially as ben oil, and it’s for good reason! This name was derived from the high quantity of behenic acid (up to 9%) that the oil contains. No other oil even comes close to having this level of behenic acid–but more on that later. The oil has a pale yellow color, has a very mild nutty flavor, is odorless, is non-sticking, is non-drying, is liquid at room temperature and resists rancidity lasting for several years after it’s produced. Incredible! 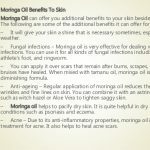 It’s important to point out that most organic moringa oil on the market has been diluted with a lower quality oil in an effort to drive down cost. Our moringa seed oil is 100% pure and unadulterated right from the source in India so you can get the full benefit of this amazing substance. It’s an incredible Godsend! Moringa oleifera seed oil, like olive oil, contains high amounts of monounsaturated acids. The oil is made of up to 72% oleic acid (C18:1) which is a monounsaturated, omega-9 fatty acid. This high concentration of oleic acid gives the oil excellent moisturizing characteristics. Of major significance is the fact that the organic moringa oil also contains up to 9% behenic acid (C22:0). Behenic acid, a saturated fatty acid, is often used in moisturizers, hair conditioners and lubricating oils. It is the behenic acids conditioning properties that help to keep skin and hair soft and smooth. For comparison, peanut oil has the next highest concentration of behenic acid with up to 3%. Other oils contain very low levels (1% or less) of behenic acid if they contain any at all. For a complete list of fatty acids that make up Moringa oleifera oil, see the chart at the bottom of this page. Organic Moringa seed oil is a good source of vitamin E found in three different tocopherols (α-, γ- and δ-). The tocopherol concentrations are reported to be 98.82–134.42, 27.90–93.70, and 48.00– 71.16 mg/kg, respectively. Moringa oleifera oil contains small amounts of many phytosterols and even cholesterol as well. It is reported that the sterol composition of Moringa seed oil differs greatly from those of most of the conventional edible oils. Many of the Moringa oil benefits come from these sterols. Beta-sitosterol is used for heart disease and high cholesterol. It is also used for boosting the immune system and for preventing colon cancer, as well as gallstones, the common cold and flu (influenza), HIV/AIDS, rheumatoid arthritis, tuberculosis, psoriasis, allergies, cervical cancer, fibromyalgia, systemic lupus erythematosus (SLE), asthma, hair loss, bronchitis, migraine headaches, and chronic fatigue syndrome. Marathon runners sometimes use beta-sitosterol to reduce pain and swelling after a run. Some people apply beta-sitosterol to the skin for treating wounds and burns. 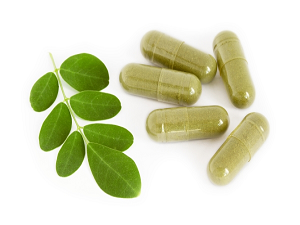 Stigmasterol is found in Moringa oleifera oil in concentrations of approximately 115mg/100g. It possesses powerful hypoglycemic, antioxidant, and thyroid inhibiting properties. Campesterol is found in Moringa oleifera oil in concentrations of approximately 75mg/100g. It is believed to be an anti-inflammatory and also has shown to help mediate osteoarthritis. While much research is still being conducted, here is a summary of some research that has been already published on therapeutic properties of Moringa oil. The oil is hepatoprotective which means it has the ability to prevent damage to the liver. In a test conducted in 2013, it was determined that Moringa oil actually brought about recovery of the liver in rats who had experienced induced liver damage. We can thus infer from this study that M. oleifera seed oil possesses a very high therapeutic potential which underlines its ability to bring about recovery from CCl4-induced hepatic damage. It also appears M. oleifera seed oil is capable of reversing or inhibiting lipid peroxidation in liver cells; further studies are therefore needed. Moringa oleifera oil is a light oil that is non-sticky and absorbs quickly into the skin. Moisturizer: With the oil’s high oleic acid content, it makes for an excellent, non-sticky, skin moisturizer. It can also be used on skin conditions such as psoriasis or eczema and chapped lips. Skin and Hair Care: Again because of the very high behenic acid concentration, the oil exhibits conditioning properties that help to keep skin and hair soft and smooth. The oil is very thin and spreads further than would be expected. Simply rub into skin or wash into wet hair. Cleanser: Oil is reported to help eliminate acne and blackheads. It may also help remove spots from acne when used on a long-term basis. Anti-aging oil: Due to the high anti-oxidant and behenic oil concentrations, the oil helps improve and rejuvenate the appearance of aging skin. 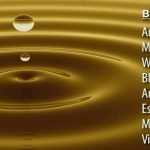 Carrier oil for homemade massage oils: With the properties described above, the oil makes for a great carrier oil in homemade massage oils. Base for homemade perfume: Since the oil resists rancidity and has such a high oleic acid level, it makes an ideal choice for a perfume base. It also has the ability to absorb and retain scents and fragrances! Base for homemade soaps: The oil has been reported to make a good base for homemade soaps. 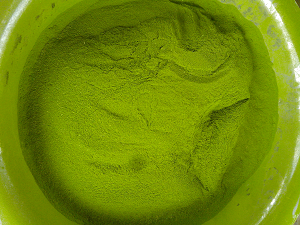 Moringa has also traditionally been a topical ointment for treating several different ailments. When applied to the gums, it’s said to eradicate gum disease. As an astringent, it kills germs on the skin, heals abscesses in the teeth, cures athlete’s foot, and heals warts and wounds. Data presented in the table below was taken from research conducted on the seed oil from the “Periyakulam 1” Moringa oleifera seed in 2000. This product not evaluated by the FDA and not meant to and is not intended to diagnose, treat, cure or prevent any disease. Information and statements made are for educational purposes and are not intended to replace the advice of your treating doctor. 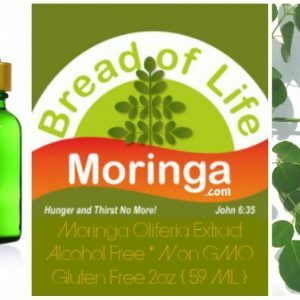 Bread of Life Moringa does not dispense medical advice, prescribe, or diagnose illness. The views and nutritional advice expressed by Bread of Life Moringa are not intended to be a substitute for conventional medical service. If you have a severe medical condition or health concern, see your physician. All our products have been sourced from a reputable organic wholesaler, however, we are each quite unique, therefore before using any herbal supplements, we suggest that you consult with a health care professional. Many herbs/supplements contain ingredients that have strong biological effects, and such products may not be safe in all people. If you have certain health conditions and take these products, you may be putting yourself at risk. Your health care professional can discuss with you whether it is safe for you to take a particular product and whether the product is appropriate for your needs.